Long before this area of the Blue Ridge Mountains became Table Rock State Park, it was inhabited by the Cherokee Indians who referred to it as Sah-ka-na-ga, which translates as the “Great Blue Hills of God.” It is here at beautiful Table Rock that the Cherokee believed their god sat down to feast, using the rocky mountain ledge as his table. In 1785, the Hopewell Treaty was signed by the Cherokee Indians and the United States government; this treaty laid out boundaries for white settlers who wanted to live near Table Rock. Another treaty signed in 1816 gave even more land to the settlers. Shortly after the land surrounding Table Rock – or Table Mountain, as early records show it was often called – was claimed by white settlers, tourists began to travel to the mountain. As early as 1816 local resident Cornelius Keith, Jr., son of the area’s first white settler in nearby Pumpkintown, petitioned the South Carolina General Assembly for a turnpike road to the mountain to accommodate visitors from the lower part of the state. 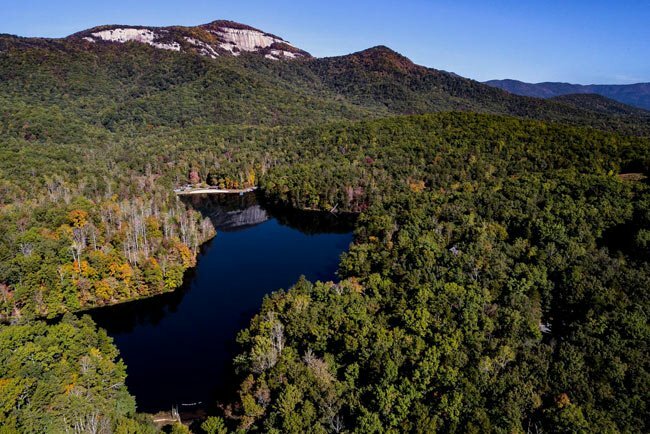 His request for a road was denied, but people continued to come to the mountain in search of a cooler climate and a display of natural beauty not found in other parts of South Carolina. Soon John Keith – a brother of Cornelius – and another local, William Sutherland, opened an inn in Pumpkintown for vacationers. It was small but operated for several years. By 1845 Sutherland had expanded the business and completed the Table Rock Hotel, which boasted 20 rooms. The hotel was located near the base of the mountain within the present-day park. Sutherland and his family lived at the hotel and maintained it until his death in 1859. Guests followed early hiking trails to reach the mountain’s summit. At this time, steps were bolted into rocks, making the ascent more level and somewhat easier than it is today. Tourism to the mountain subsided following the death of Sutherland and the onset of the Civil War. After the war, Stephen Keith revived the hotel as a summer resort. The hotel moved to another location in 1900, then moved again in 1912 to a nearby waterfall, Slickin Falls. 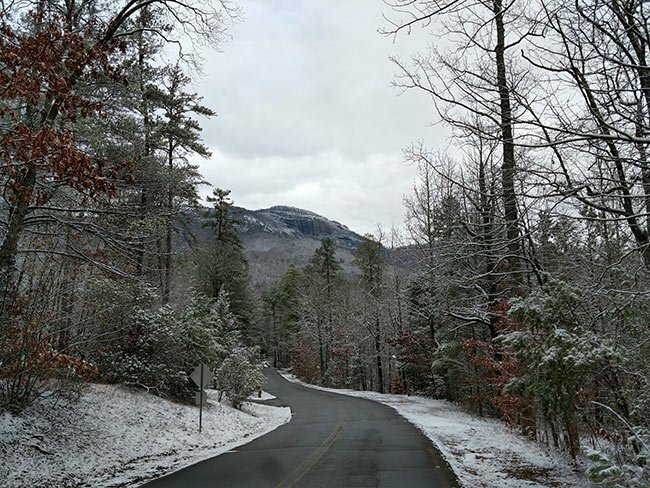 The mountain was sparsely visited from the time the hotel moved until the early 1930s, when as part of President Franklin Roosevelt’s New Deal, the Civilian Conservation Corps (CCC) was formed as a work relief program. 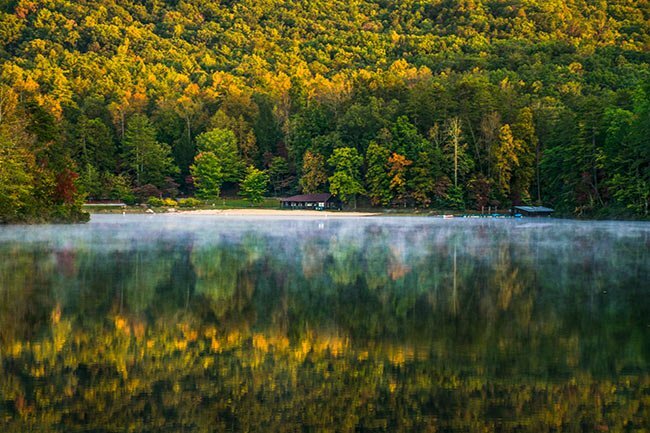 Under the direction of the National Parks Service, state parks were developed by CCC workers – who were sometimes World War I veterans – and often used local timber and sawmills for the projects in order to stimulate local economies. 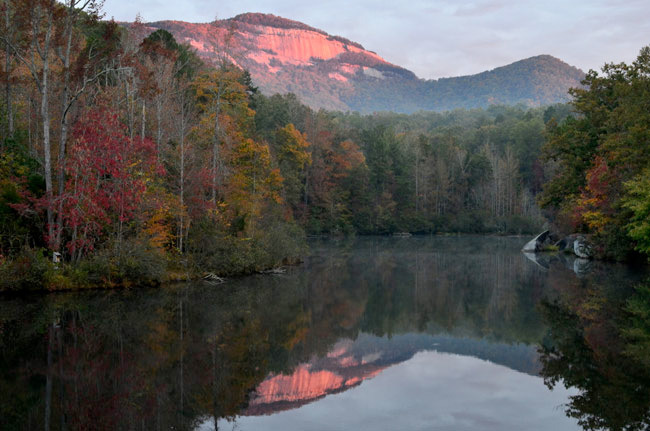 Table Rock was designated as a desirable area for a state park, and the City of Greenville donated 1,010 acres and Pickens County gave 1,670 acres towards the park. These entities purchased land from local landowners and then transferred it to the state. 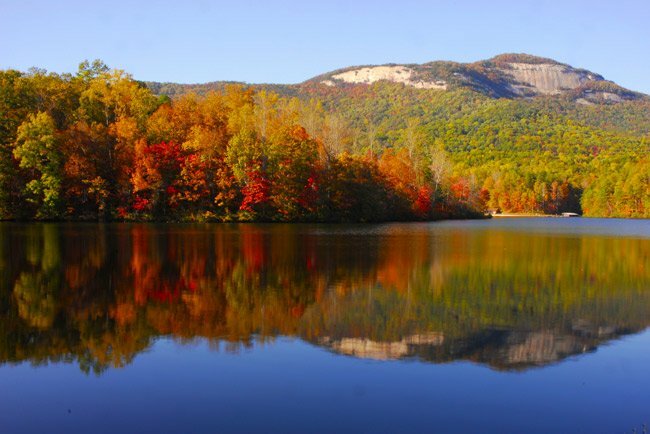 Today Table Rock State Park covers more than 3,000 acres. 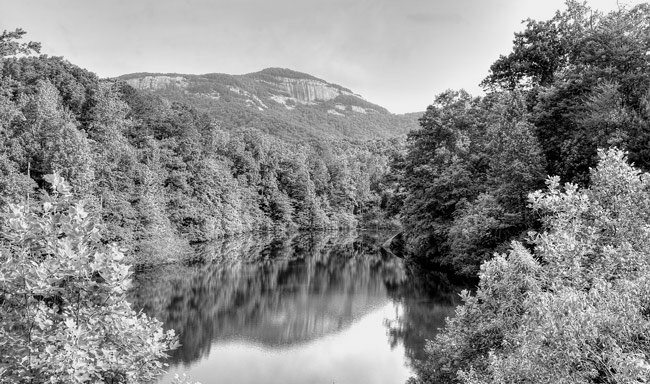 The campsite where the CCC workers stayed while building Table Rock State Park still bears traces of the park’s early days. Standing near the visitors center are artifacts from the masonry structures built in 1935 by the United States Army to house the CCC workers as they built the park structures and developed the land. The workers were divided into two camps: Camp SP-5 mostly built the park, while Camp SP-6 dammed Carrick Creek to create Pinnacle Lake (seen below). The CCC workers built all of the pre-World War II structures within the park, including the cabins and lodge, seen below. The workers from SP-6 disbanded from Table Rock following the completion of the dam in 1937. The park opened to the public the following year, in 1938. The CCC workers from SP-5 stayed until 1941 and then left at the beginning of World War II due to lack of funding for government programs. 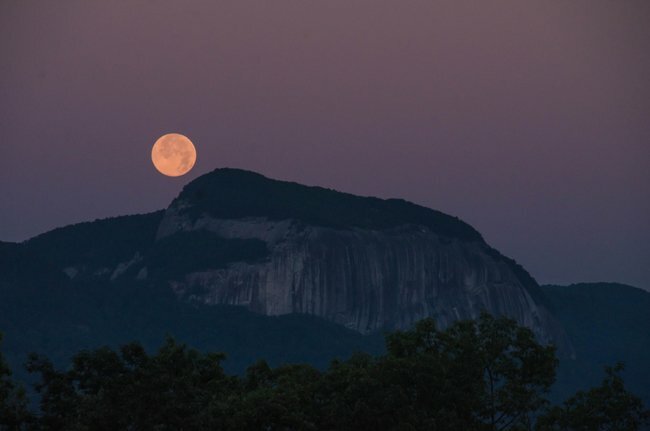 A visit to Table Rock State Park introduces guests to the wonders of the Blue Ridge escarpment and allows people to stay within the charming CCC-built structures. Others with a taste for a more rustic experience can stay at one of the designated campsites within the park. In addition to the aforementioned Lake Pinnacle, where visitors can rent kayaks and canoes, the park also features the 67-acre Lake Oolenoy across the street from the park entrance. 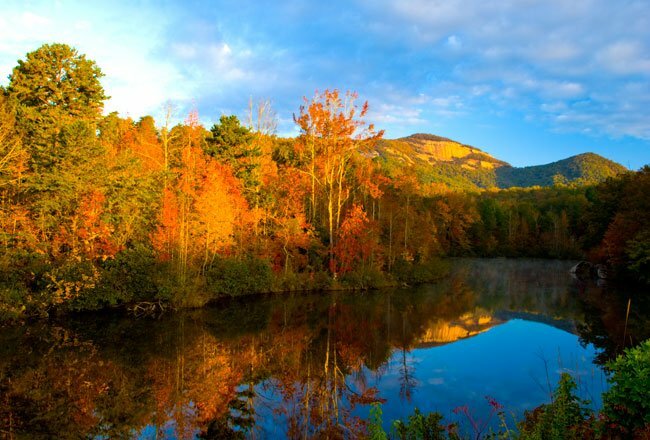 The park has one of the state’s oldest natural education programs and serves as a trail head for the 80-mile long Foothills Trail through the South Carolina mountains. While the park offers several hiking trails, the most popular one is Table Rock Trail, leading to the 3,124-foot summit of Table Rock Mountain and featuring spectacular views from the rockface itself. 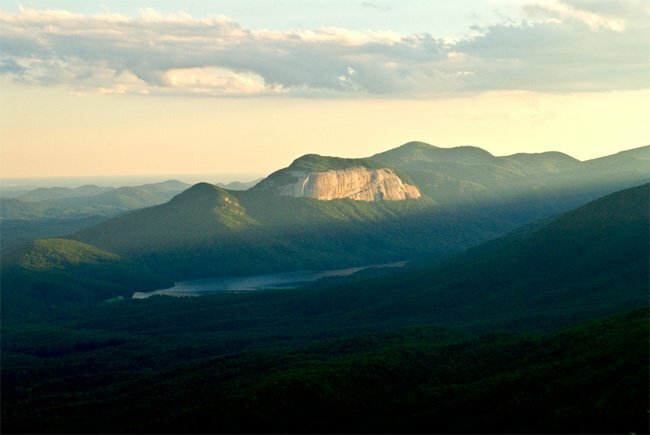 About a mile below the Table Rock overlook, hikers are treated to another remarkable vista from Governors Rock (seen below). 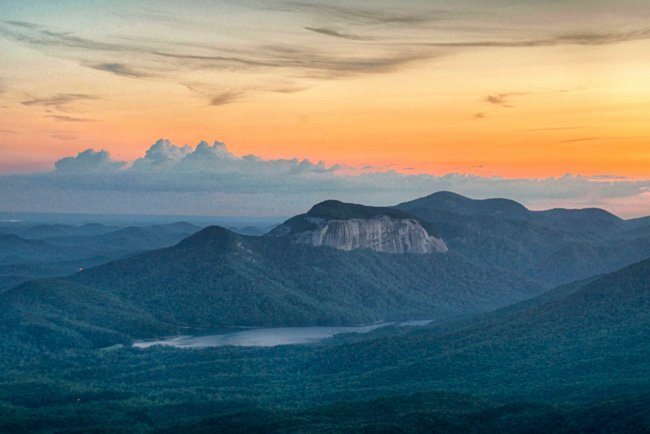 From its broad granite surface, hikers can view Pinnacle Mountain – the state’s tallest mountain (3,415 feet) that rests entirely within the state – as well as Sassafras Mountain, which straddles North Carolina and boasts the state’s tallest peak at 3,553 feet. 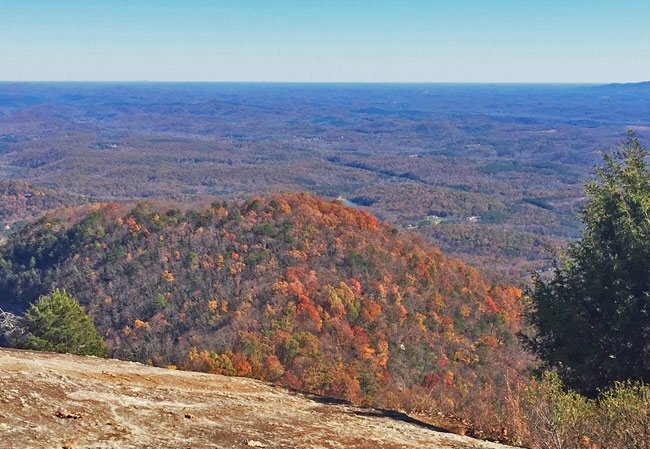 Though the goal of the trail is to reach the Table Rock overlook, Governors Rock offers more space for people to sit and enjoy the view and is generally more populated with hikers. The summit of Table Rock Trail is reached prior to the breathtaking overlook, which is worth the few more minutes of hiking. 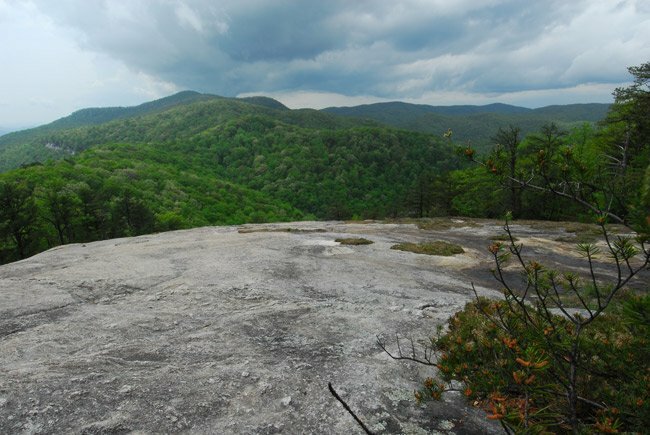 From the Table Rock overlook, seen below, people can view the Table Rock watershed, including the Table Rock reservoir, Pinnacle Lake, Lake Oolenoy, and Saluda Hill Baptist Church. 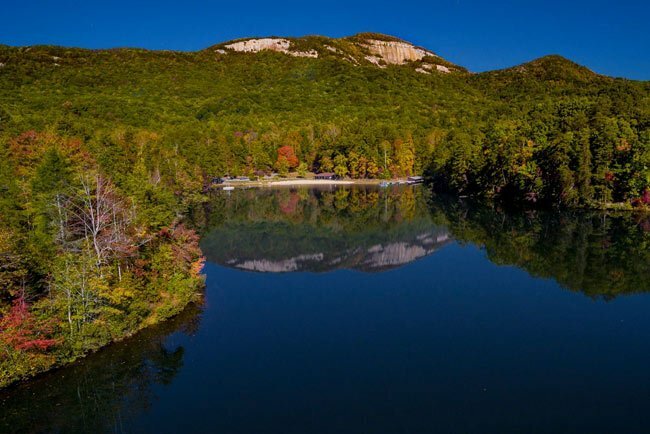 Table Rock State Park Historic District is significant for its cultural and social relationship to the history and prehistory of the area within the state park boundaries and is also architecturally significant as an example of the construction of a state park by the Civilian Conservation Corps (CCC). 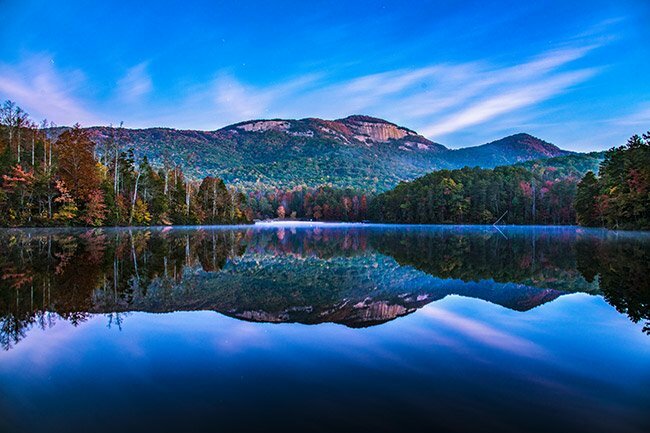 It is also significant as one of sixteen state parks constructed by the CCC, under the direction of the National Park Service (NPS), as part of the South Carolina State Park System. Pinnacle Lake is the focal point of construction and many resources are grouped around the lake. These buildings and structures are connected by a system of roads and trails designed to take advantage of scenic, natural and constructed features. 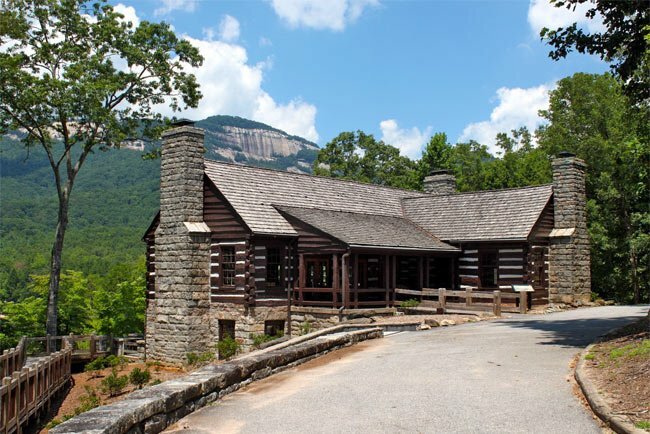 Examples of the CCC’s work includes: Table Rock State Park Dam, the lodge, bathhouse, concession building, cabins, trail and picnic shelters, fish rearing pools, warden’s building and several trails. Check out the Table Rock webcam. Hi Linda! 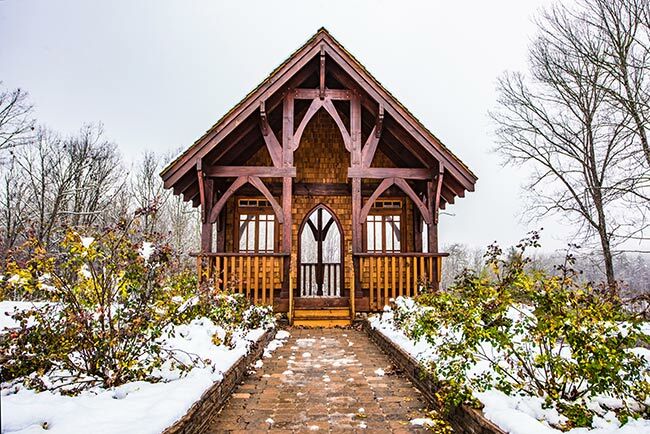 We have added a photograph of a small wooden chapel at Table Rock above. 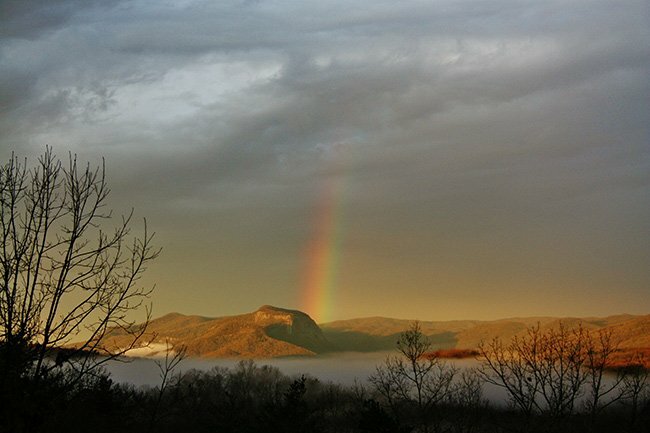 It is the first picture under the “More Pictures of Table Rock” heading. Is this the church you are referring to? If so, can you tell us more about it? Information on it is scarce, and we’d love to be able to document it in greater detail. Thank you! Can anyone tell me what happened to the little wooden Chapel that used to be in the park? My great-grandfather was a CCC worker (he died in one of the cabins) and his wife was a cook at the lodge. Any pictures or more information would be appreciated. Hey Sherri, we are definitely interested! Going to email you now, thanks! My grandfather Norman House was the first supervisor of the CCC. My mom (1936) and Aunt (1938) were both born in the cabin they lived in during that time. I have old pictures of those days if anyone is interested. This site was very informative. 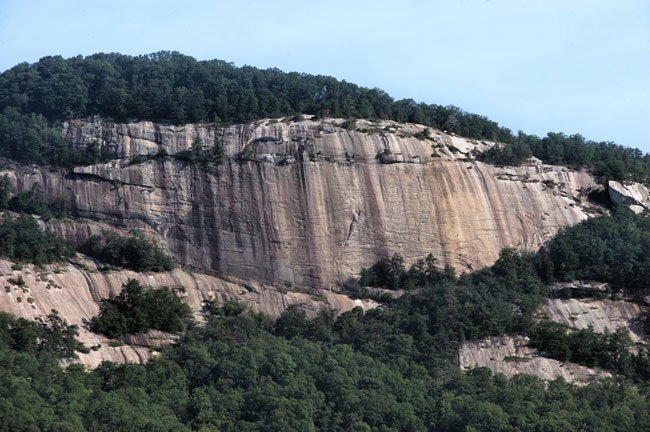 I have lived in SC for 62 years and never knew this about Table Rock. I am excited to go visit it. Thank you. Thank you for making the slides, I needed that information to learn more about the beautiful parts of S.C. This also helped me with my homework, THANK U SO MUCH.